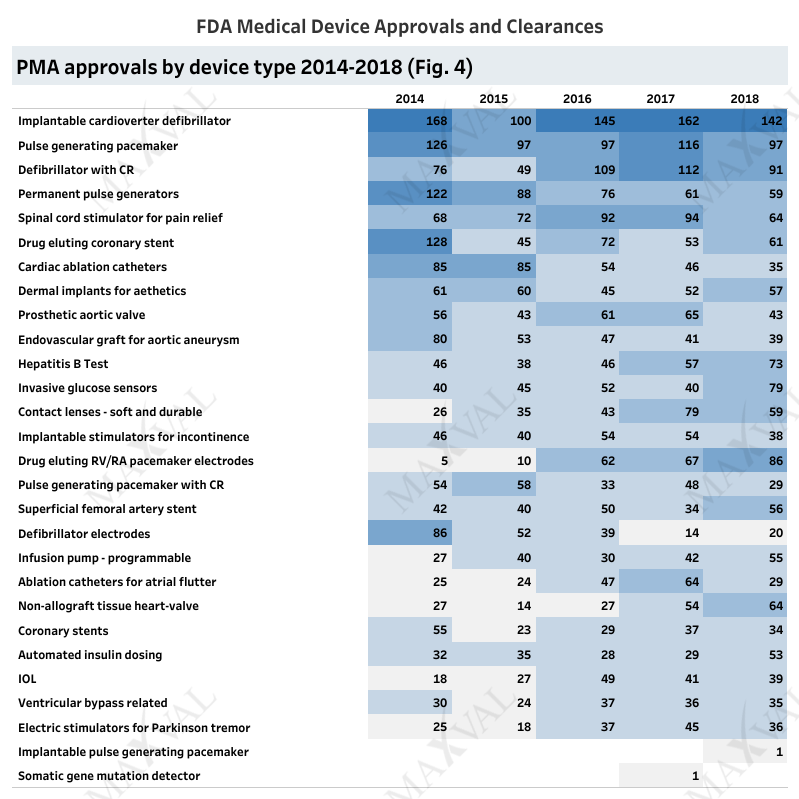 The CDRH had an engaging year with a total of 2790 Premarket Approval Application (PMA) approvals for class III devices. The 2018 PMA approvals represent a modest increase of 2.5% from the previous year (Fig. 1). The PMA approvals for original applications and panel fast track supplements were at 57. There was a 4.3% dip in 501(k) filings for low to moderate risk devices (Fig. 2). Nine devices were approved or cleared under breakthrough designation. 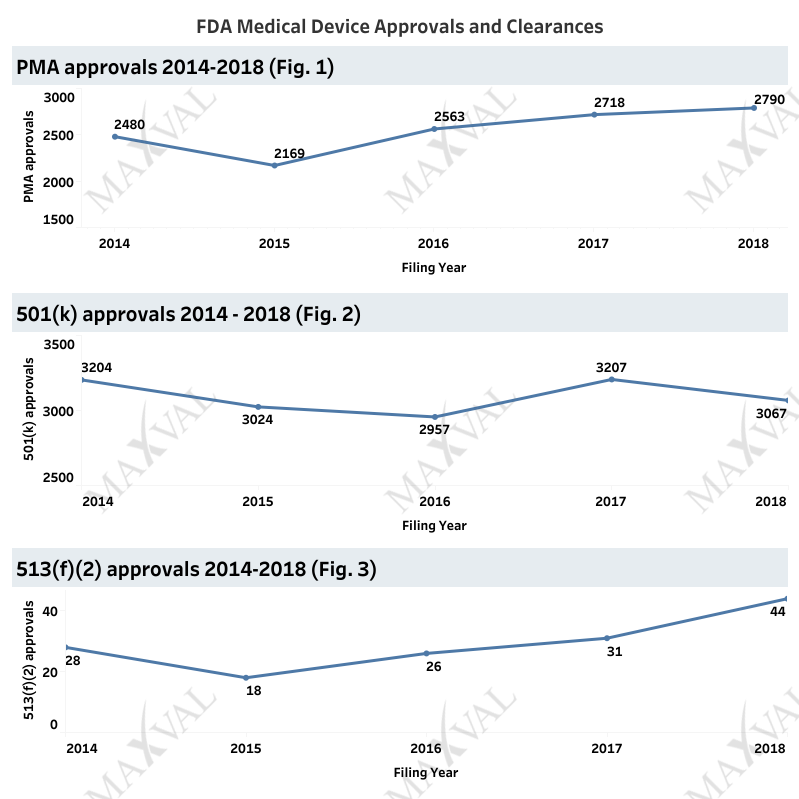 Medical devices approved under section 513(f)(2) (de novo) filings witnessed a growth of 30% from the previous year (Fig. 3). A total of 44 de novo devices were approved in 2018. Two new devices were approved under Humanitarian Device Exemptions (HDEs). Cardiac implants continue to be the top type of devices receiving PMA approvals, with diabetes management devices cutting a distant second (Fig. 4). Some examples of these include implantable cardioverter-defibrillators, pulse generating pacemakers, defibrillators that allow cardiac resynchronization, drug eluting pacemaker electrodes, and glucose sensors. 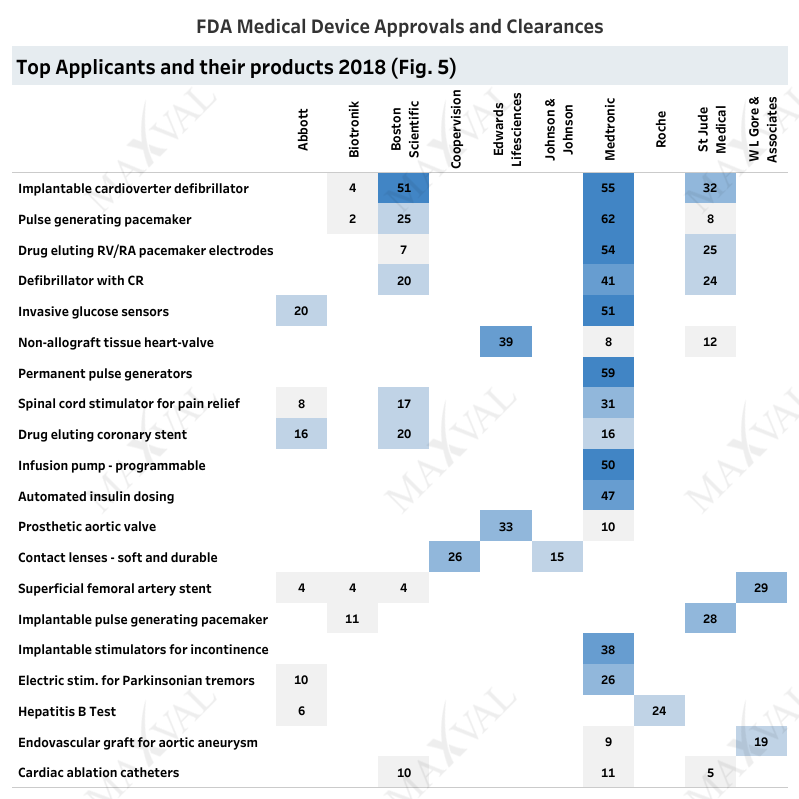 Increased approvals were also observed for spinal cord stimulators to relieve pain, modified contact lenses and IOLs, dermal implants for aesthetics, automated insulin delivery and programmable infusion pumps. A closer inspection of the top applicants (Fig. 5) revealed a 2% growth for Medtronic (734 PMA approvals) including device approvals for drug eluting stents (Resolute Integrity and Resolute Onyx), and the Valiant Navion thoracic stent graft system. 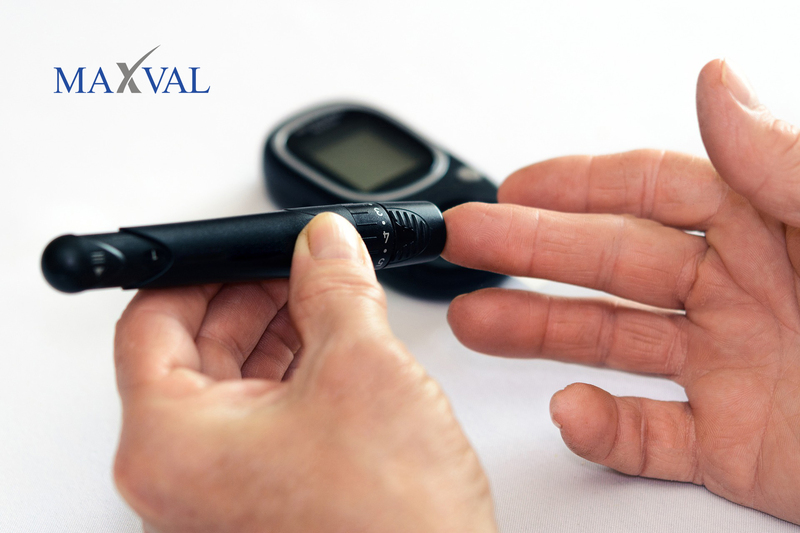 Glucose monitoring systems from Medtronic that were approved last year include devices from the Minimed series (closed loop insulin delivery system) and the Guardian Connect system. The filings of Boston Scientific (250 PMA approvals) dipped by about 36% as compared to 2017. One significant approval was for the Eluvia vascular stent that elutes the drug paclitaxel. St. Jude Medical, a subsidiary of Abbott won 178 PMA approvals – the highest in the last five years. Abbott had several approvals including a real time diagnostic kit for leukemia that detects up to five mutations from patient samples, a suture closure system, and the Freestyle Libre Flash Glucose Monitoring System. Abbot also received approval for the world’s smallest heart valve - Masters HP™ 15mm – for treating pediatric patients. Roche’s PMA approvals were up by 21%, rounding off at 140. Johnson & Johnson’s PMA approval numbers were down by 46.4% as compared to 2017, with most of their approvals revolving around IOLs and contact lenses. Other notable approvals include GORE® Carotid Stent, GORE® CARDIOFORM Septal Occluder for permanent implant, Biotronik’s papyrus covered coronary stent approved under HDE, artificial intelligence-powered IDx-DR diabetic retinopathy detection system that won a de novo clearance. Kaneka Pharma’s Liposorber® LA-15 System approved to treat adults and babies with nephrotic syndrome under HDE, the world’s first artificial iris to treat congenital aniridia, and the first blood test to evaluate mild traumatic brain injury approved under breakthrough category. Between January and March 2019, CDRH has already approved several devices for varied applications. Among the novel FDA approved devices of 2019, Sangia Total PSA Test for prostate cancer detection uses a fingerstick to aid in cancer detection. Another cancer assay-based device that detects program death ligand – I (PDL-I) in patient samples was also recently approved by the FDA. Barricaid® Anular Closure Device (ACD) is a recently approved titanium implant inserted in the spinal bone of the lower back to prevent/reduce reherniations in hernia patients. MANTA Vascular Closure Device is an FDA approved system designed to close large puncture sites after the use of large catheters in blood vessels. Two new models of MitraClips also won FDA approvals in mid-March and will be used to treat patients with mitral regurgitation. VENOVO Venous Stent System that is designed to be used to reopen narrowed regions of the iliofemoral vein was also approved recently. 2019 is expected to be an important year for the medical devices market. Some of the key drivers include M&As, increased focus on software as a medical device (SaMD), potential cybersecurity risks, and regulatory changes at the FDA level, such as modernizing 510(k) submissions and implementing post-market surveillance. In the healthcare industry, home-care services and point-of-care testing is expected to increase in popularity. Stay tuned for our future updates focusing on new medical devices, market trends, financials, clinical trials, and litigation.